Wynter returns from a five-year exile in the bleak Northlands to find her beloved homeland in turmoil. King Jonathan’s civilised, multicultural realm is no more; the gibbets and cages have returned. Days of laughter, friendly ghosts and gossipy cats remain only in Wynter’s memory – the present confronts her with power play, dark torture chambers, violent ghosts, and cats (those still alive) too scared to talk to humans. The Inquisition is a real and present danger. Crown Prince Alberon is missing. There are murmurings of a ‘Bloody Machine’ of untold destructive power. And as Wynter and her friends, Prince Razi and the mysterious Christopher Garron, seek to restore stability to the fragile kingdom, risking death at every turn, Wynter is forced to make a terrible choice. Set in a fantastical medieval Europe, this is the first book in a compelling trilogy of court intrigue, adventure and romance. It draws the reader in from the very first sentence and doesn’t loosen its grip until the last. This is marvellous, vivid writing, and storytelling at its absolute best. It reminded me of the first time I read Philip Pullman - I was utterly engrossed. Kiernan has a great sense of theatricality at her fingertips: the story unfolds and is revealed at exactly the most climatic moment . . . Kiernan is masterly in her storytelling. The beginning of what promises to be a powerful trilogy with YA crossover appeal, this epic starts strong and doesn't falter one iota, ending with a cliffhanger that will leave readers demanding more... Atmospheric, complex, and intense. 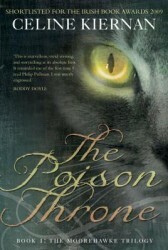 Striking debut novel, a fascinating historical fantasy characterized by vivid, colourful writing.